This last weekend for Easter I decided I really wanted some sort of fruit dish for breakfast. 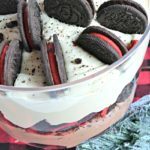 So I used one of the bases for my Oreo trifle recipe (*HERE and HERE) and made a new and Easy Fresh Fruit Trifle for Easter Sunday brunch!! It balanced out our meal really well with all the fruit and light cream cheese pudding…and everyone LOVED how pretty it was!! It’s a really great shower side dish or brunch side dish idea too!! 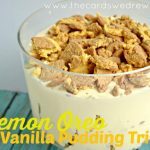 In a large bowl, combine the cream cheese, cool whip, banana cream pudding and milk and mix until creamy and thick. 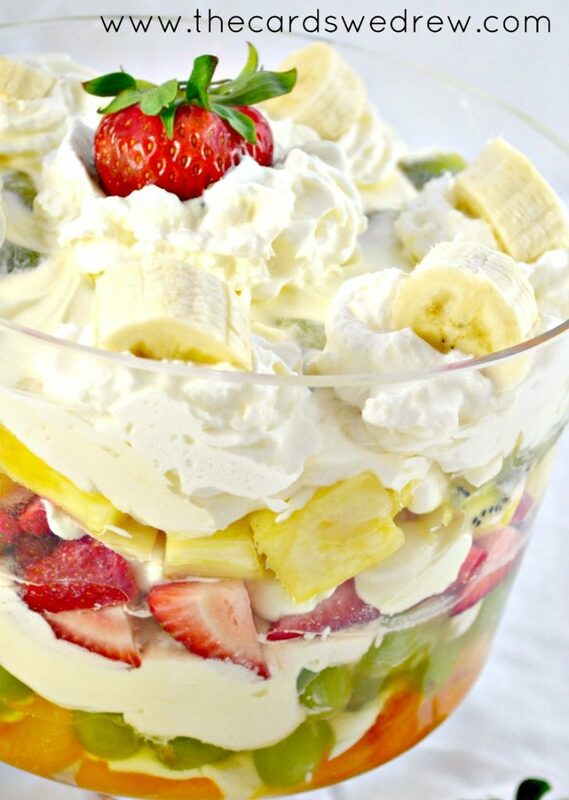 In a trifle bowl, start by adding a layer of fruit on the bottom followed by 1/2" of pudding mixture, then another layer of fruit, then pudding and so on all the way up to the top. Make sure all fruit is well drained and cut up. 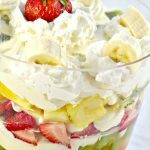 Once it's all layered, add dollups of whipped cream on the top and slice bananas to place in the whipped cream for added decoration. Add one large strawberry to the center. Once you've placed the bananas, serve immediately. If making in advance, save the bananas and whipped cream on top until you're immediately ready to serve. 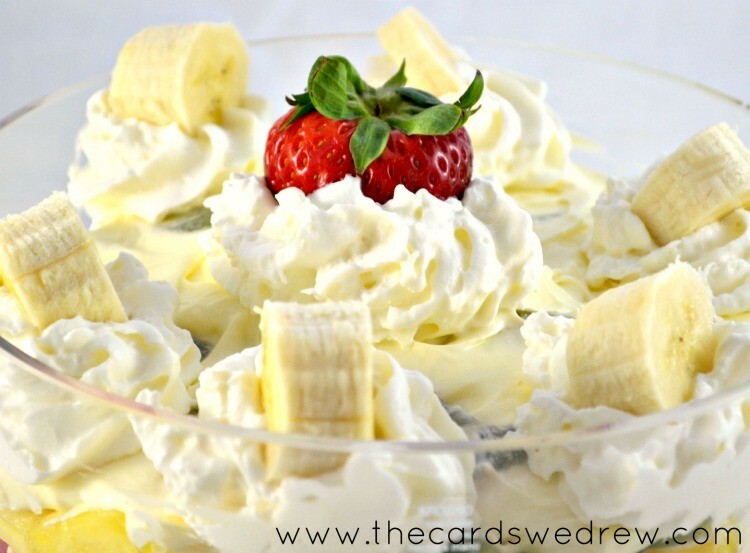 I feel like this can be made the night before your event or gathering, but just leave the bananas and whipped cream off the top until you’re ready to serve. 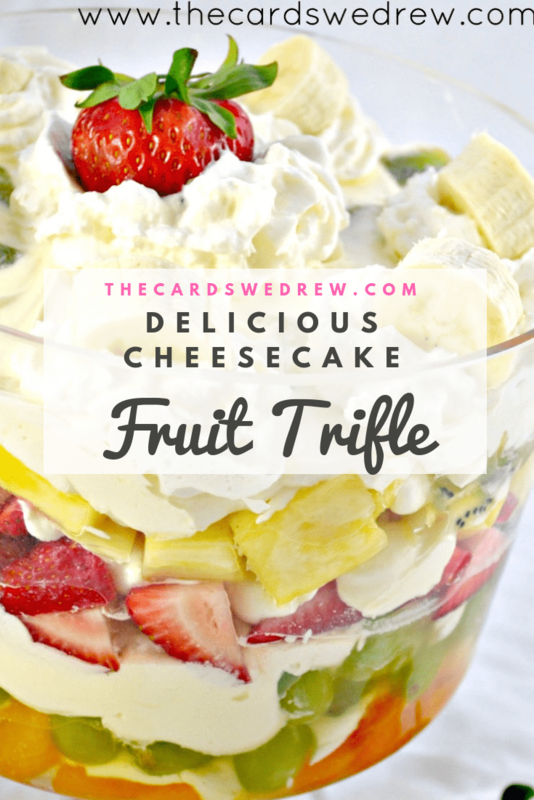 I just love this easy cheesecake fruit salad recipe and your guests will too! Hope you enjoyed this fruit trifle recipe!! Be sure to pin this to your favorite board for later! 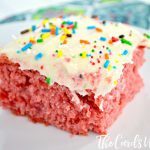 I’d love it if you shared this at my link party, Peace Love Linkup! This looks delicious. 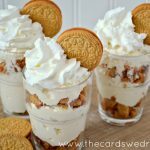 What size container of Cool Whip did you use? Did you use a real cut-up pineapple or can you use canned pineapple?